Pacific Electric interurban no. 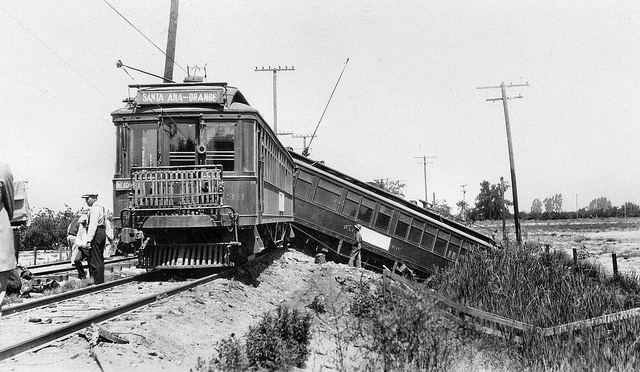 1039 and its train await the repair crew after they hit a hay truck at high speed on the Santa Ana Line in July 1927 with spectacular results. I couldn’t help but wonder why that truck carrying hay was on the track in the first place. From looking at the photo, the double track is situated on a fairly high embankment. Is there a grade crossing that is leveled with the tracks? From the look of that spectacular wreck in 1927, there had to some casualties. The Pacific Electric Ry had many grade crossings, I can’t help but wonder how many train/car collisions at these crossings the railway had to endure.